The rolling shutter effect — universally despised by videographers. In newer cameras using CMOS sensors, the image is scanned from top to bottom every frame. 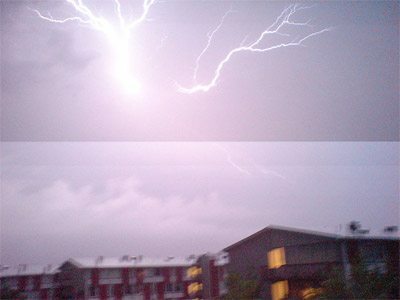 This means that very fast motion, or events that occur extremely quickly (such as camera flashes) will appear distorted. Camera flashes may only take up a part of the frame; straight lines may appear “jiggly” when moving quickly; the image may be skewed. Videographers routinely complain about this phenomenon, as it can make for some pretty strange-looking video. There’s really no way to get around it — that’s just the nature of using a sensor that doesn’t capture the full frame in one moment of time. But the rolling shutter effect is getting a bad rap. Take a look at this guy who put his iPhone inside his guitar while he played it. You’ll gain a whole new appreciation for Mr. Rolling Shutter.